Today’s travel photo brings us to Istanbul, again courtesy of New York-based writer and photographer, Jennifer Pinkowski. 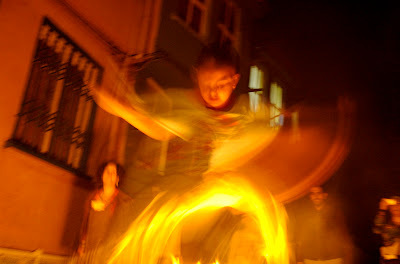 It depicts fire dancing done in recognition of the Hidirellez Festival, an annual event beginning May 5. It’s a five-day, Roma-inspired street festival with music and food near Ahirkapi, a gypsy neighborhood not too far from the Topkapi Palace and the Hagia Sophia.